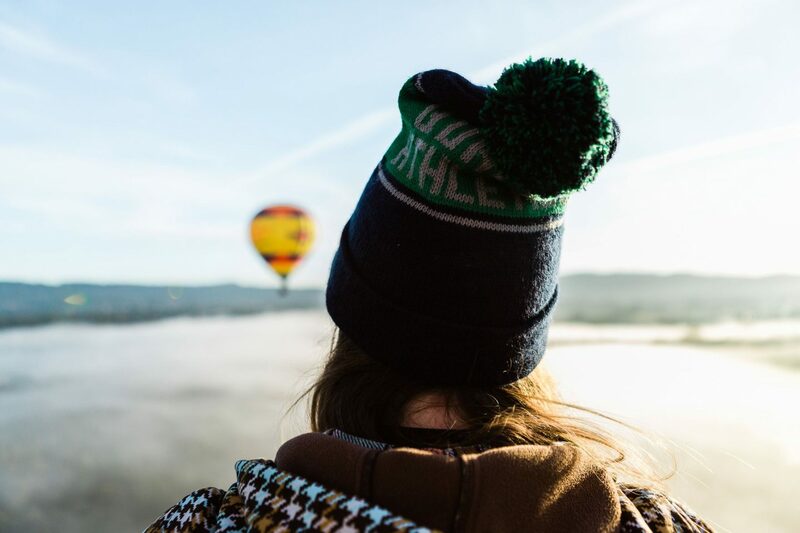 Riding a hot air balloon has been on the top of my bucket list forever. 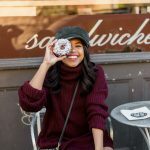 I even wrote about it in my 26 Things I want to do at 26 post earlier this year. 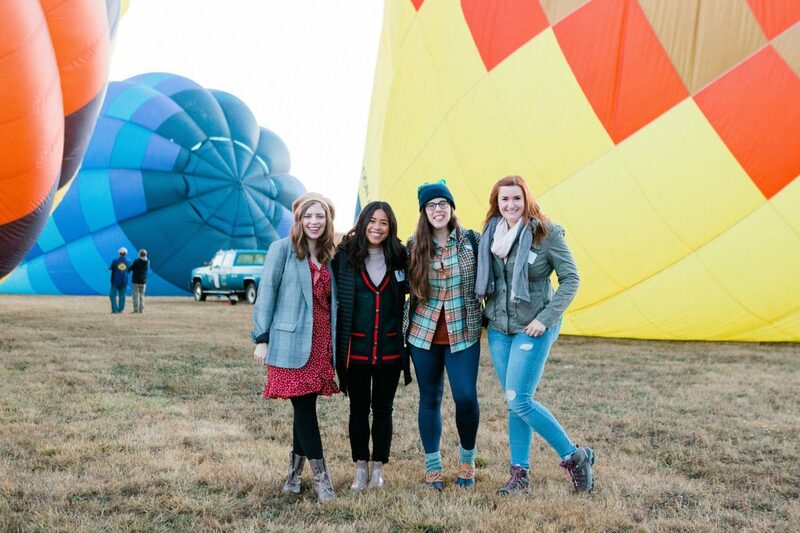 And this past fall I got to cross off this incredible experience with a long weekend glamping trip in the Willamette Valley with Travel Oregon and Oregon Wine Country! 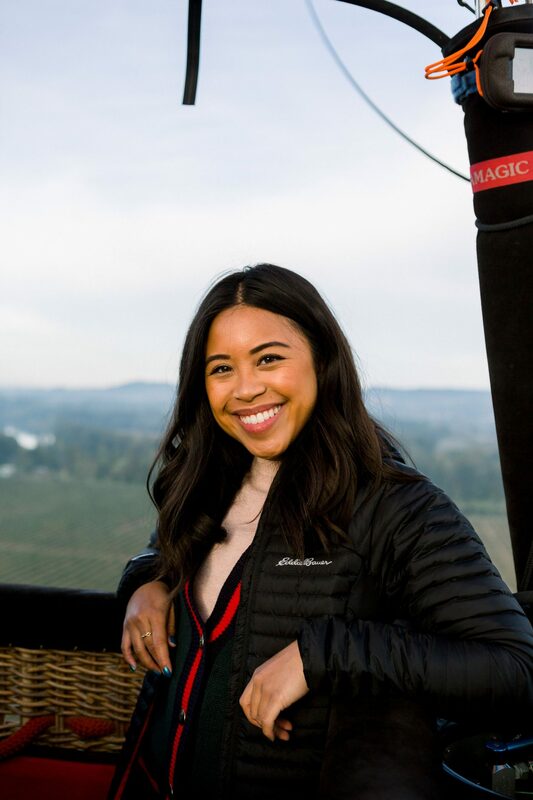 I’m thankful that I got to experience my first hot air balloon ride with my fellow Seattle bloggers: Adria from @emeraldpalate, Jen from @hellorigby, Marissa from @postcardstoseattle, and Kate from @allthingskate. 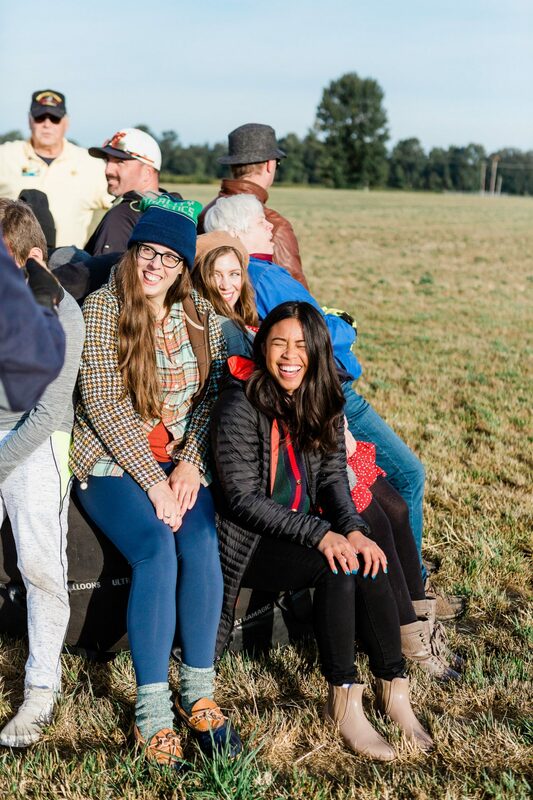 We had so much fun exploring the Willamette Valley to celebrate the 50th Anniversary of the US Trail System and the 175th Anniversary of the Oregon Trail! 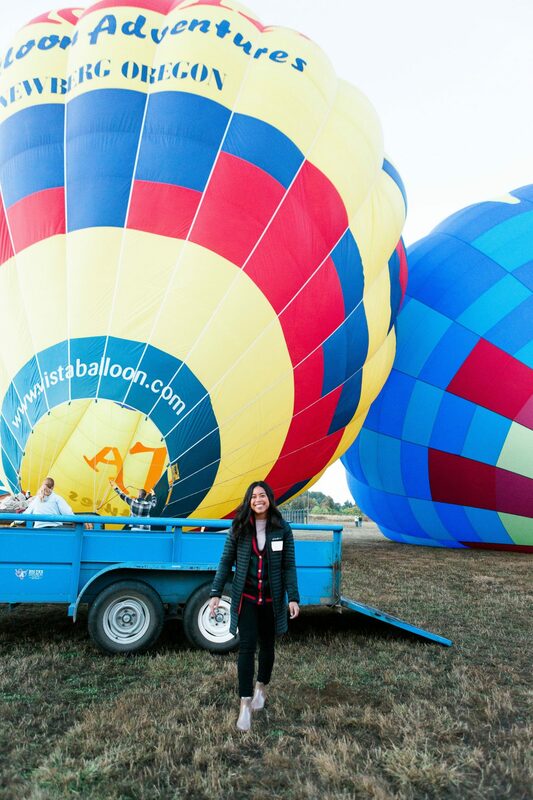 If riding a hot air balloon is also on your bucket list, this blog post is for you! Hot Air Balloon Ride Surprise #1: We almost missed out hot air balloon because we didn’t know the hot air balloons take off as soon as they’re completely filled…. 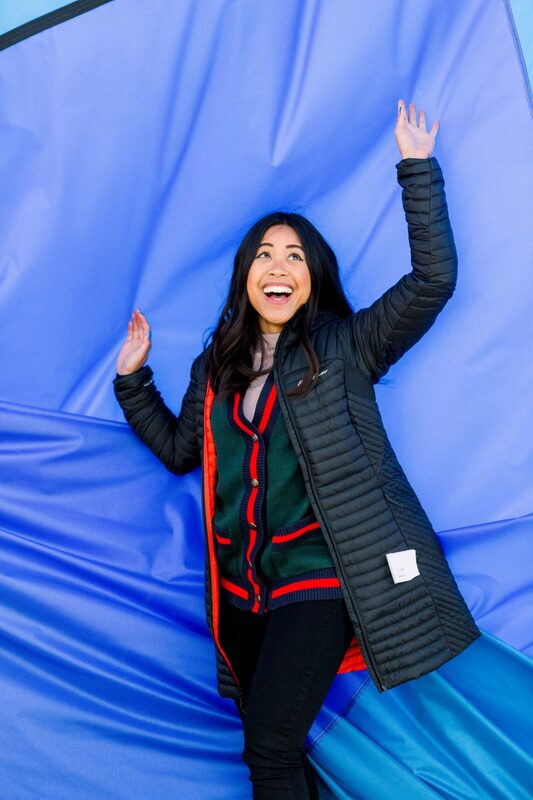 Have you ever seen those Instagram photos of the girls with the giant hot air balloons filled in the background? Well I was hoping to recreate those photos while they were filling up the right hot air balloons on the field. I guess I should have assumed that the balloons take off right when they’re completely filled and upright but we were not prepared to almost be left behind. 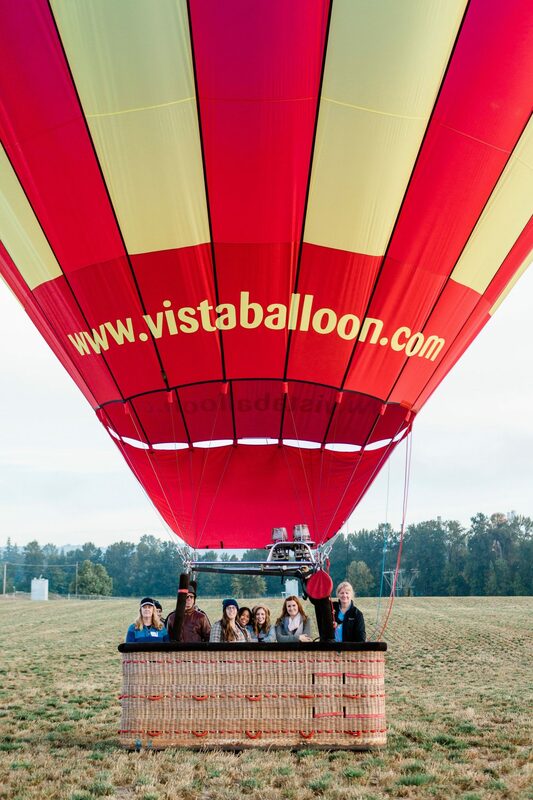 We immediately sprinted to the balloon after this group shot and climbed into the baskets for takeoff. We were the last members of the group and the other passengers already claimed their corners of the basket! 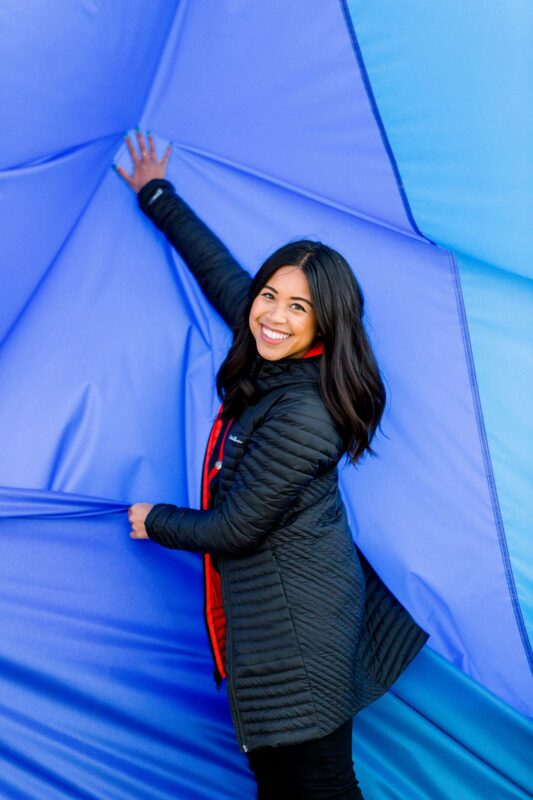 Advice: If you’re trying to get a cute photo of you with the hot air balloons on the ground, make sure the hot air balloon isn’t your ride! 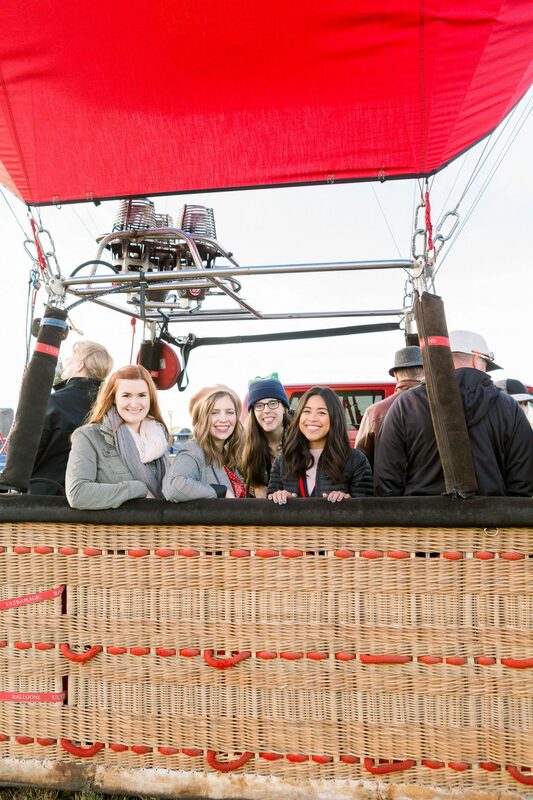 How many people do you think can fit in a hot air balloon basket? Maybe 5? Or how about 8? Well surprisingly our basket fit 11 people! I had no idea baskets could hold that many people! In our group alone, we had 5 of us bloggers + our photographer. Usually the baskets hold up to 10 people, but that number can vary depending on the weight of the total group. Hot Air Balloon Ride Surprise #3: The hot air balloon goes up and down in the atmosphere to catch different wind directions. I knew that there was no propeller on hot air balloons but I also didn’t understood how they navigated the winds. I learned from our hot air balloon pilot that the balloons will climb and descend to catch specific wind directions. I was also surprised to learn that the hot air balloon pilot will squirt a little shaving cream towards the ground to see which way the wind is blowing beneath the balloon! 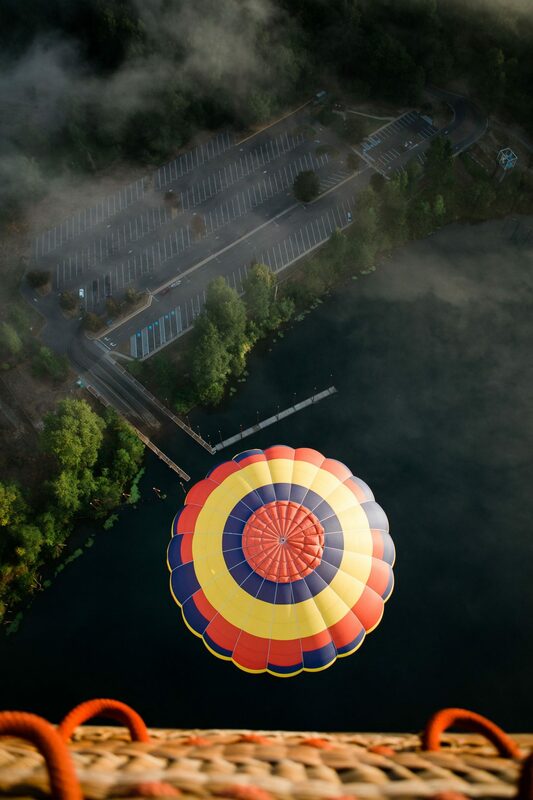 We had some balloons fly above us past 3,000 ft and we had other balloons almost touch the river beneath us! Hot Air Balloon Ride Surprise #4: Because of the varying wind directions and altitude changes, the temperature also fluctuates. Before we left for the hot air balloon ride, we knew we had to dress in layers because it was already a chilly morning. 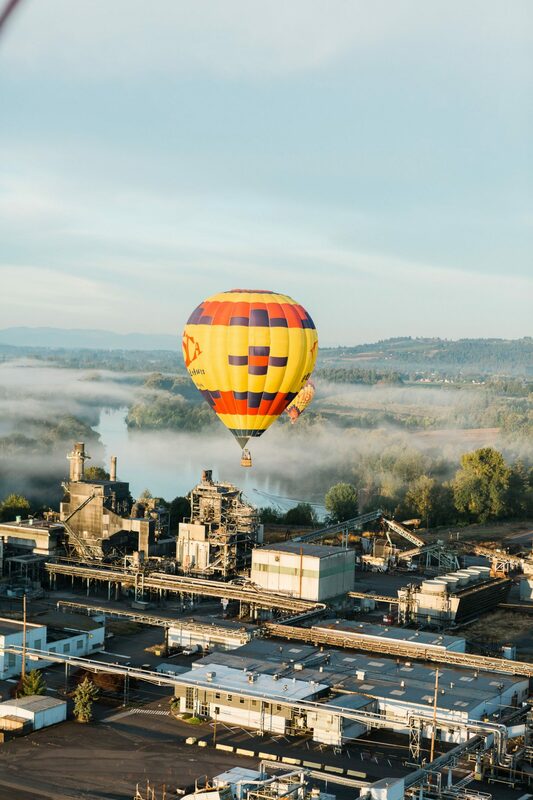 I didn’t realize how much cooler it would be up in the air and then how warm it felt when they hot air balloon pilot turned the burner on to fill the balloon with hot air. Because of the temperature fluctuations, I recommend dressing in layers. You can always unzip your jacket if you get too warm! But I’m personally glad I wore a warm jacket, cardigan, and sweater that day! 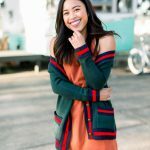 Dress in layers – sweaters, cardigans, or thermals would be a great idea! Hot Air Balloon Ride Surprise #5: If the weather is nice and the conditions are ideal, you get to fly in the air for up to an hour. I had no idea we were going to get to hang out in the sky for as long as we did! For some reason, I thought hot air balloon rides would be shorter. But the entire hour we were in the sky absolutely surpassed by experiences. We lucked out and it was super clear out when we flew that day. 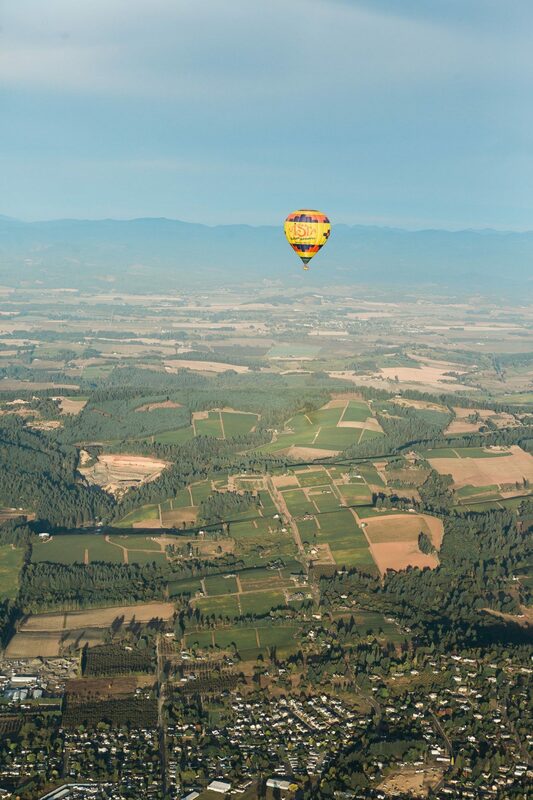 We got to see the gorgeous peaks of the Cascade Mountains, the Willamette Valley, and more. 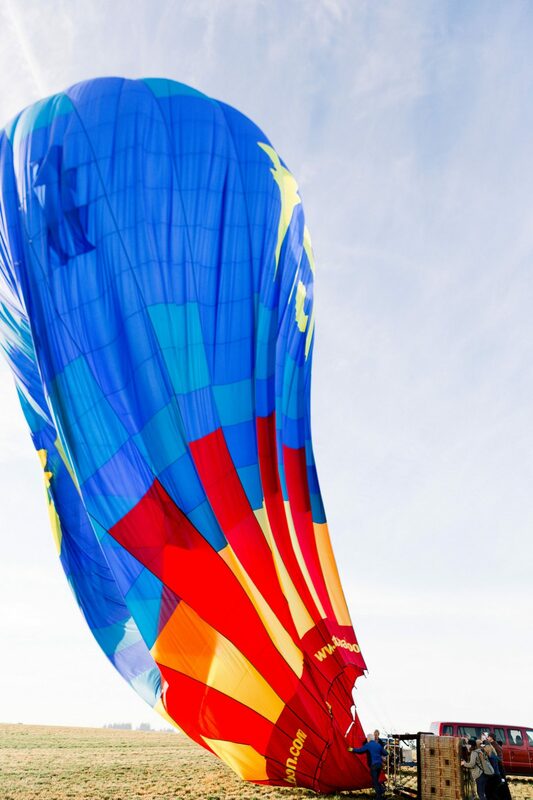 By the way the whole hot air balloon experience from set up to flying to landing and packing up the balloon takes up to 3 ½ hours! 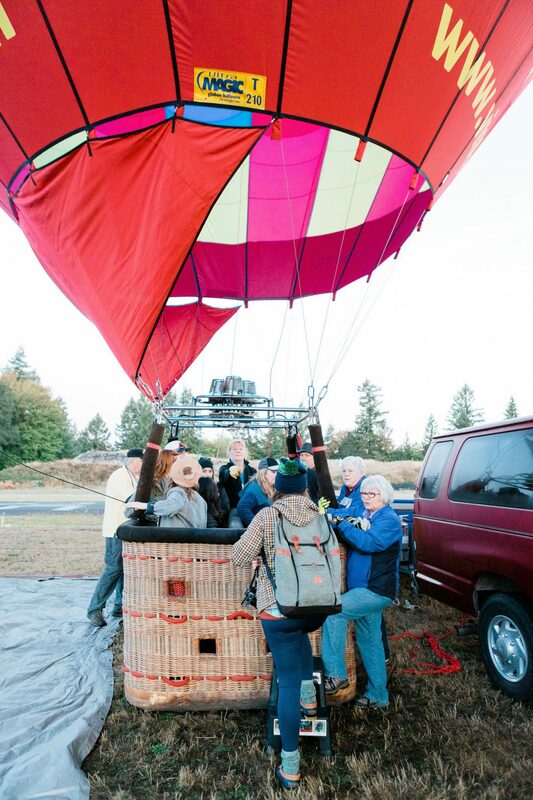 Hot Air Balloon Ride Surprise #6: The hot air balloon and basket may bounce when landing. For some reason I imagined a hot air balloon floating down softly into a field of grass. 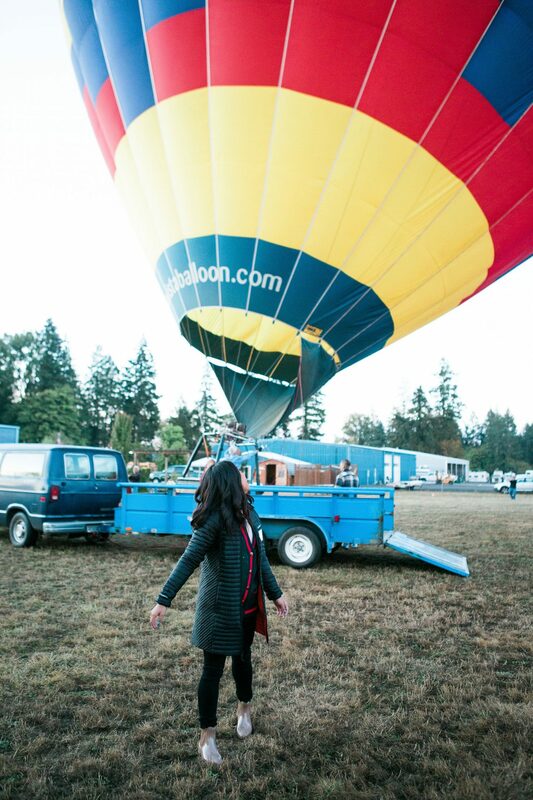 But in reality, our hot air balloon bounced a few times before settling onto the field of grass. 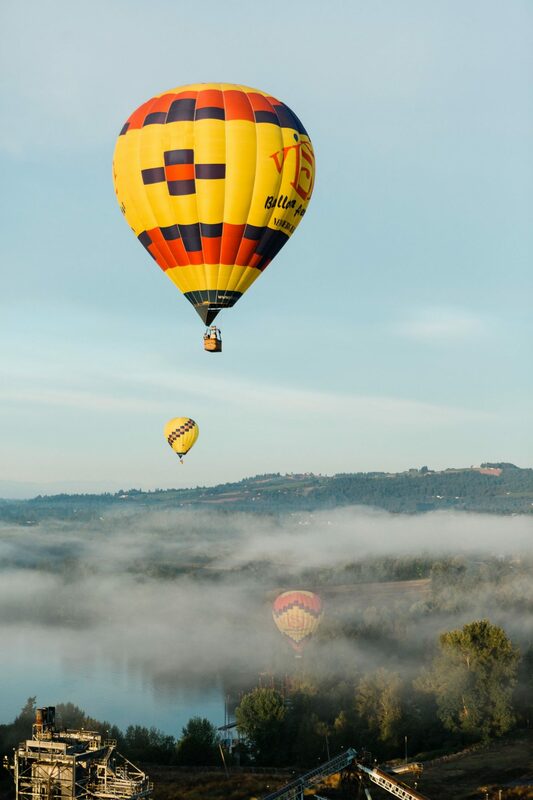 In rare circumstances, you may experience a high wind landing and the hot air balloon pilot will warn you to get into the right position to land. 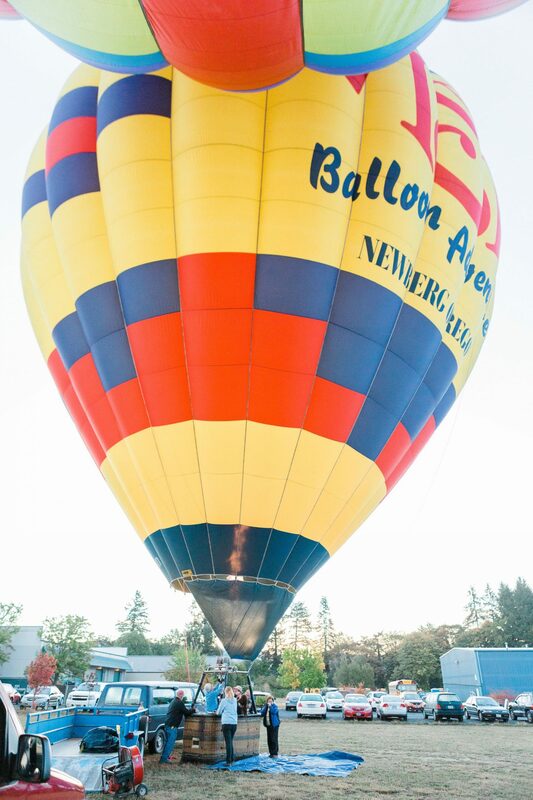 Because of this possibility and risk of injury, pregnant women are not allowed to ride a hot air balloon. Hot Air Balloon Ride Surprise #7: Putting away a hot air balloon is hard work. 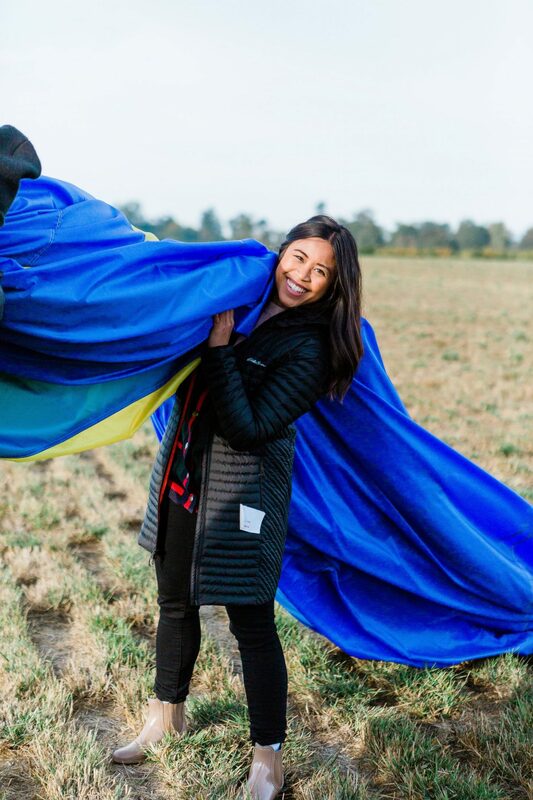 One of the most unexpected but fun things about the whole hot air ballooning experience was putting away the hot air balloon. I had no idea that all of the guests were going to help load up the baskets onto the trucks and also roll up the hot air balloon. 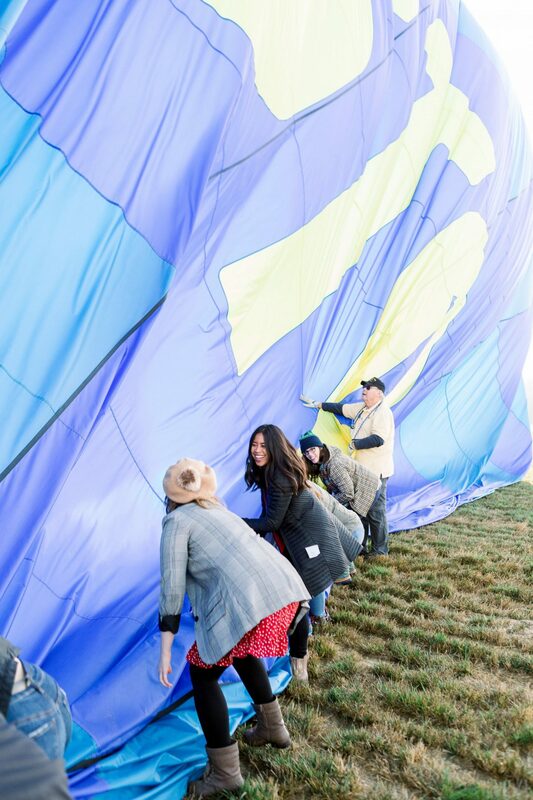 It truly was a team effort to roll up the massive hot air balloon! 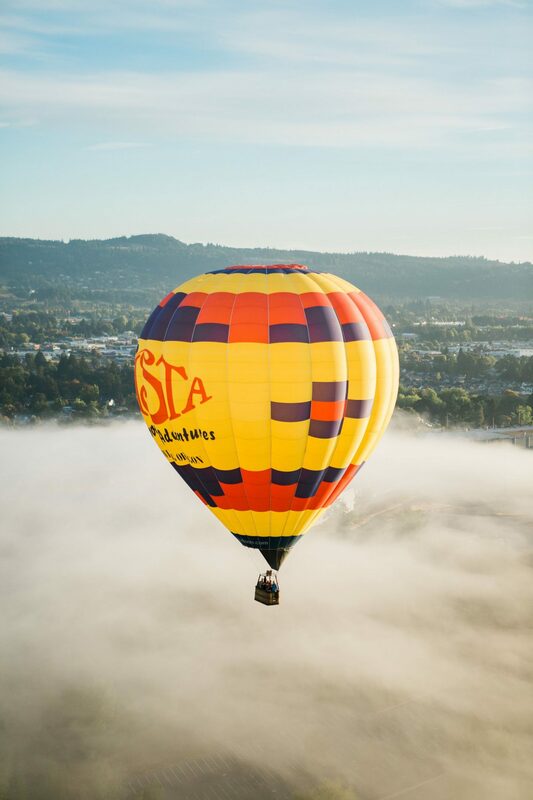 Thank you again to Vista Balloons Adventures from Newberg, Oregon for the wonderful hot air balloon experience + brunch after the ride! We had so much fun! 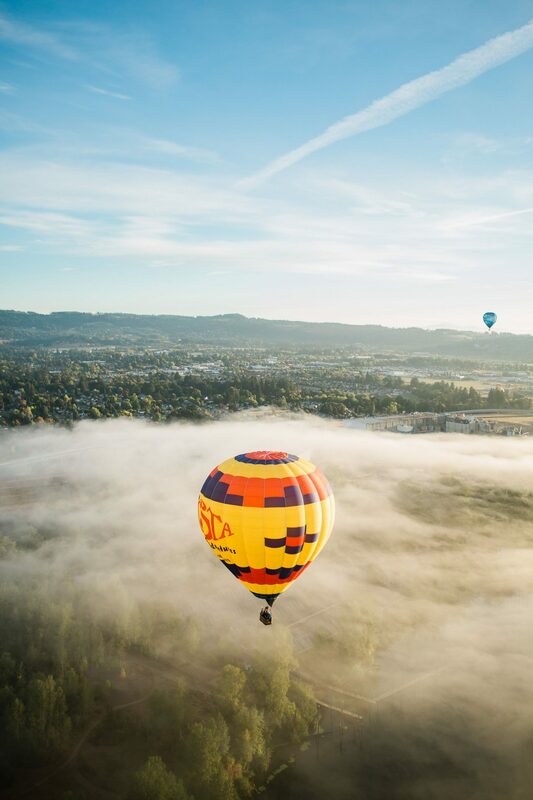 Have you ever flown in a hot air balloon before? 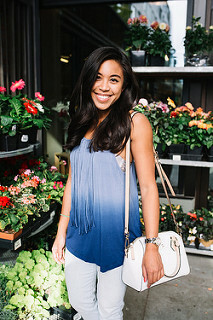 Blogger events are the best! And this one is so cool! As much as I am scared of heights this still makes me want to try it out one day! What an amazing and priceless experience! Love the photos and that shaving cream tip is something new to me as well!